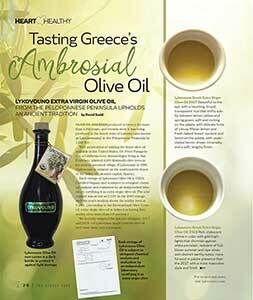 Lykovouno Olive Oil is grown and produced in Greece on the private estate of San Francisco Dermatologist Dr. Peter Panagotacos. This estate was started in 1985 on the slope of his ancestral village of Lykovouno with the help of his cousin, who still lives there. Over 4000 Koroneiki trees were planted at that time. It was Dr. Panagotacos' intention to produce the finest quality olive oil sold in the United States. 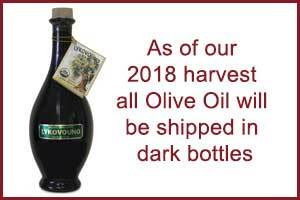 Lykovouno Olive Oil is hand picked, cold pressed, and hand bottled on the family estate. Lykovouno Olive Oil is pure Koroneiki olive oil, solely produced on this estate, not blended with other oils. It is unsurpassed for its exquisite and flavorful aroma, possesses excellent organoleptic qualities. It has a fresh fruit-of-the-olive taste and aroma with hints of fruit, pepper and grass. The hard work and effort to produce a gourmet olive oil has resulted in State Fair awards, both in Lakonia, Greece and in the Los Angeles County Fair. So Many Ways to Try!